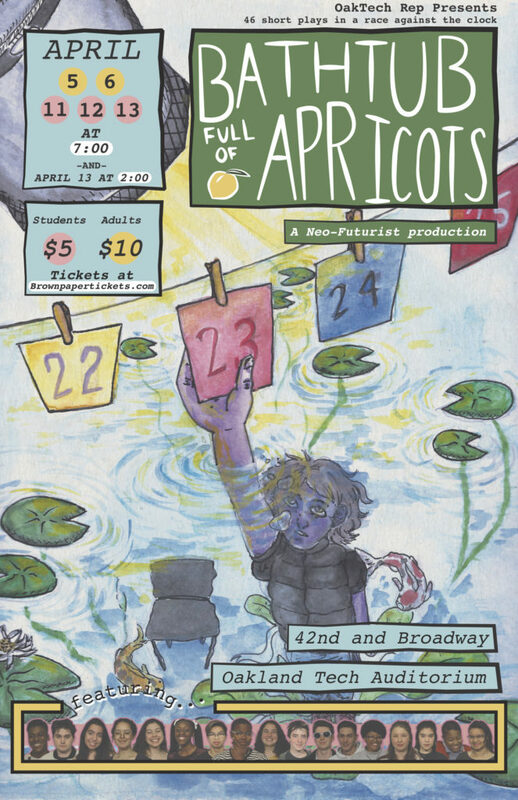 Prepare to be wowed by OakTech Rep’s neo-futurist production, “A Bathtub Full of Apricots,” on April 5, 6 11, 12 & 13. Ranging from black history to bar mitzvahs, teenage angst to toilet paper, superheroes to the teachers’ strike, all 46 plays are performed in a frantic race against the clock, in an order determined by the audience each night. Written and performed by the students of OakTech Rep, this production offers bite-sized reflections on what it means to be right here, right now, as students of Oakland Tech High School. Seating is limited! We’re transforming the sprawling 800-seat auditorium into an intimate 180-seat black box theater for each performance. Purchase your tickets online here to snag an available seat, or at the door. Tickets are $5/OUSD ID and $10/general admission.